Ok, ok, we get asked some of the same questions all the time. These questions we are kind of proud to be asked. Questions such as…”How do you keep your coach looking like it does.”, “Is that new?”, “What do you use for wax?”, and “How do you wash your coach?” So in the past we had made a video on how we wash the coach and that can be found on this page, however there is a secret to how we keep the coach looking so nice that goes beyond washing it. That is, we have it professionally waxed at least once if not twice a year. Now not all washers and waxing companies are created equal and we surely have had our issues with some right down to not using the proper items to clean the coach. 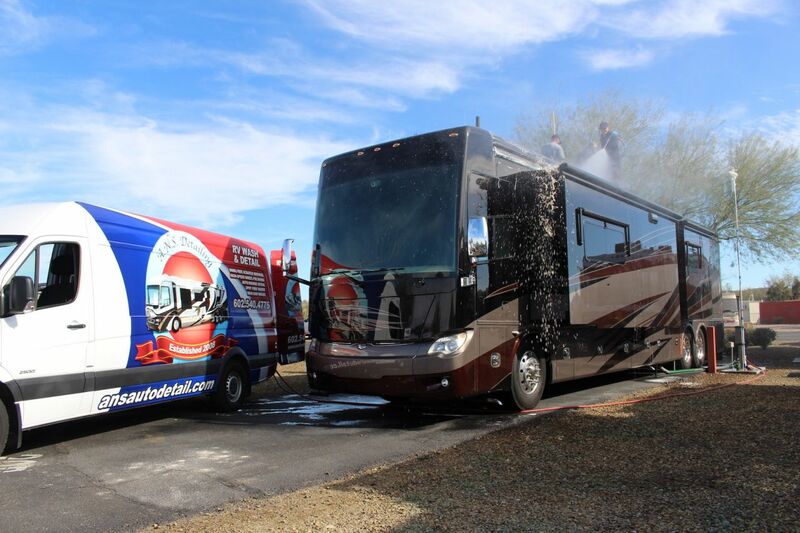 So it is important to know some things and what to watch for when having your coach or RV detailed. The first rule is when you find someone that does it right, keep them! Go back to the area at least once a year as good help is very hard to find, but when you do, you know it. So that is why we have only two people that work on our coach other than us. That is Andrew of A.N.S. Detailing and Dustin of Tiffin Motorhomes. Andrew has been doing this for some time and is not only the owner of the company, but has personally trained his excellent employees to do the work as he would, and more importantly, as it should be done. As a coach owner himself, he more understands the needs and what needs to be done. 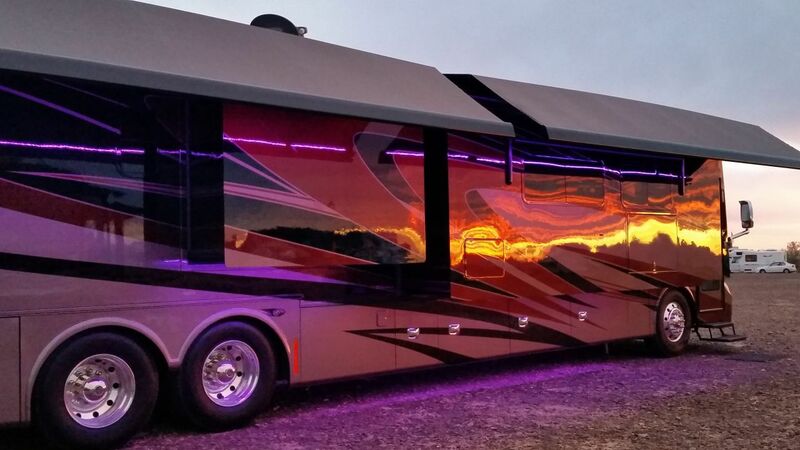 (IMHO) They do not just wash and wax coaches and RV’s from Prevost on down, but also exotic cars some of which cost more than a coach. He also works directly with the Meguiar’s company even training with them as well as training for them. So all in all, you can see why we trust him to work on our home. He can be found in the Fountain Hills area of Arizona during the winter and Spearfish, SD area in the summer. 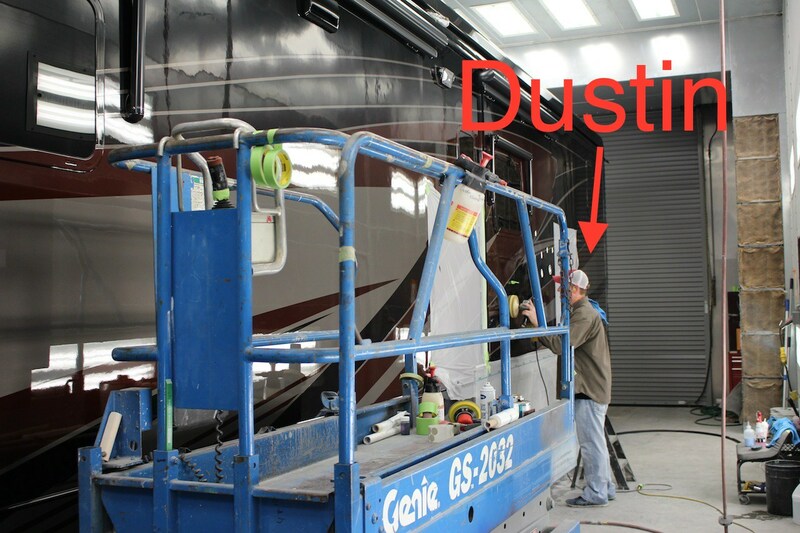 Dustin works for Tiffin Motorhomes as a painter in the service department. He has worked not only in the build plant doing paint work, but really shines when he works by himself or with a teammate under his guidance. Seeing we had special work done paint wise on our coach, Dustin is the one I ask for and choose to only work with, as he understands the needs of this particular coach. So along with that, he is the only other one that is able to wax it when work has been done. I trust his work as he takes pride in making something look factory new again. He is polite, funny, and just seems to care. Not that others are not the same for we have worked with various people at Tiffin of course, but in the case of paint…he is my go to guy. So, back to washing and waxing. Of course we made a video on it which talks about the items to use, how to use them, and what to look out for when having your coach or RV washed and waxed. But in a nutshell, Only Lambswool for washing with poll head or Lambswool Mitt on the paint areas, use Boars Hair Brush Head (which is actually soft and not cheap!) for items like the roof, slide toppers, and slide topper casings, more or less anything that does not have paint. Washing using the right brushes for the right areas. And the most important item….Deionized Water for rinsing!!! The use of Deionized Water allows for your coach or RV to dry almost spot free thus not needing you to dry it, which can actually make for fine “spider” scratches. Some of you may know, we carry with us CR Spotless Water Deionizer unit to use when we rinse. 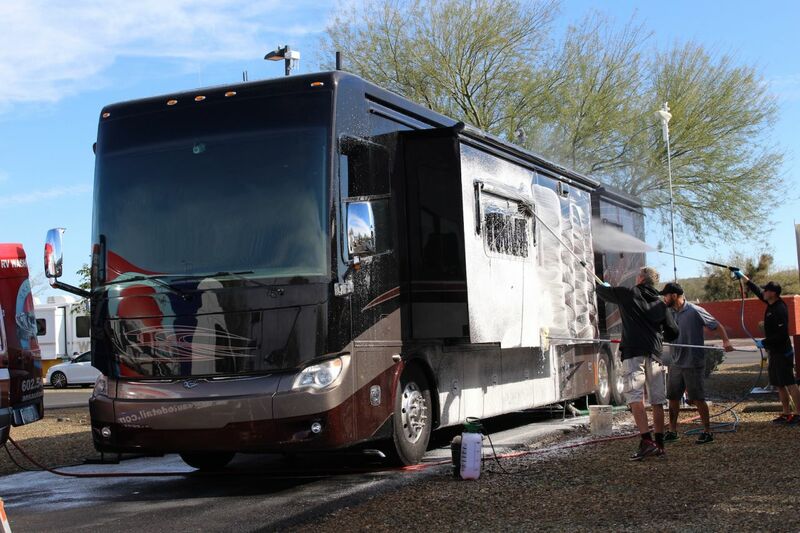 HINT…Based on where you may be, try NOT to wash your coach if it is windy and there is dust in the air as that will just collect in the water drops and make for spots. As far as what to use for soap. If you do not use a foam canon (you will see one in the video) then using baby shampoo and 1/4 cup vinegar does wonders. Just remember, it is the suds that clean…So you want a lot of suds. Our Current Wax of Choice. 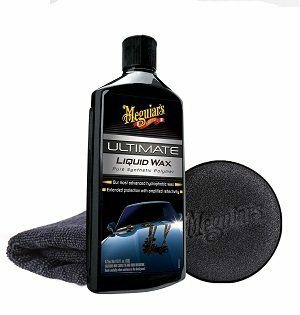 For the waxing we use Meguiar’s Ultimate Liquid Wax which is applied via a random orbital buffer. I carry with me a Black & Decker WP900 unit. The wax is then removed by hand using very soft micro fiber cloths like the AmazonBasic Microfiber Cleaning Cloths which I buy in 25 packs. Why so many? Well that is another tip…when removing wax be sure to adjust the cloth often and even change cloths or you will not only be removing wax, but also have the chance at leaving wax build up from the wax coming back off the cloth. So that’s our secret, we use a professional when it comes to the waxing of our coach. Of course before you can wax it, you need to wash it and let it dry. I surely could wax it ourselves, after all, we do wash it. But overall, well, I hate waxing so I hire it out, but only to someone I can trust and would do it like I would. PreviousRV Windshield Repair For $10.00! Concur with using Dustin at the service center, he is as described, an exceptionally hard worker with attention to detail. We do most all of our detailing and we can tell you these write ups will save you creating swirls on your clear coat. For some reason, our clear coat is a lot easier to make swirls then many other brands, car or coach. They are preventable and take a LOT of work to remove. Great write ups, we also like that wax, twice a year. Just got through having Dustin repaint a section of our coach. He is very good at what he does and takes his time. The end result is a product that is much better than what you can get elsewhere. the Western Area FMCA Rally a year or so ago that the best is made in Korea. I have some and they are diffentley far better than what is made in China. What is best contact number for Dustin at Tiffin? Tiffin Red Bay Service Center as he works for Tiffin. Thank you. I guess I did not know that waxing was available from Tiffin during hours. I will try to schedule with him. It is not. It is only after paint work. Good stuff, but you can use a boar hair brush on paint or if your prefer the cheaper lambswool. Bear in mind you will have to replace the lambs wool fairly often and a boar hair brush will last a life time if you take care of it. . Boar hair does not damage paint and is VERY soft. Using a synthetic sealer will last for 6 months easy. On the roof you could and should use a more aggressive brush. It’s not painted and stains are tougher. Ok, how about some pricing info? Getting our first coach and have no idea what is being charged for wash and wax. Hi…It can very based on the crew and location and size of coach. So a 45 foot coach you will find $300-$500 range. Again, based on the crew etc. Be VERY careful on who you use. The people David hired obviously know what they are doing. I could instantly tell by what he was saying and the products he was using, but MANY don’t. I’ve watched countless “professionals” washing coaches and actually doing damage to the paint. I watched a guy damage a coach using a circular waxer and wool pad, far too aggressive and left swirls all over the coach. I had the owner stop him before he damaged the second side. The owner didn’t realize the damage until I pointed it out to him. Learn what to ask and what they should be doing before price. If you need paint correction (done correctly) that’s going to cost more. More often then not they hire individuals who go through a short training and have no real idea what they are doing. Here is a tip, I buy all my vehicle detailing supplies by the gallon. Much cheaper and with coaches you end up using a LOT. I buy water based tire protection (which contains UV protection) by the gallon also, just realize while it’s the right stuff to use it’s pretty much gone after driving in the rain. You can also adjust the shine by the amount of water you mix in. Dave, where do you stay in Az when you get your coach waxed? COMMENTmay I ask which model CR Spotless you carry with you? It seems a lot smaller than ones I have found online, which is more in line with my needs. I really enjoy your channel! 2018 36LA, was told to never use micro fiber towels, only 100% cotton? That would be a first for me and any detailer I have ever worked with. You are correct sir! Micro fiber is a petroleum based PLASTIC and will SCRATCH the heck out of your paint. It may feel soft to the touch, but you might as well be using sand paper on your top coat. Also, never us a petroleum based wax on your coach, it will eventually penetrate the clear coat and make it turn yellow. Check out Marry Moppins, she will teach you the proper way to clean and shine your coach. She is a trusted advisor to Bob Tiffin in these matters. I would like to give a shout out to Mary Moppins (sp). She has had numerous articles in Tiffin Magazine, and is a trusted advisor to Bob Tiffin in regards to properly cleaning your coach, both inside, and out. David you Bus has to be the best looking Allegro Bus out there, I hope when you order a new coach you get as nice a color combination as this coach has. Thank you kindly. It took us just over a month to come up with it and Tiffin at first was afraid to do it thinking it would be to dark and not really work. But we hope that Tiffin will come up with a new floor plan that fits us so we can look to do it again. Take care.